Samsung has just unveiled a brand new Olympic Games Edition of the popular Galaxy Note 3 on the occasion of the Sochi 2014 Winter Olympic Games to be held in Russia between 6 and 23rd February. 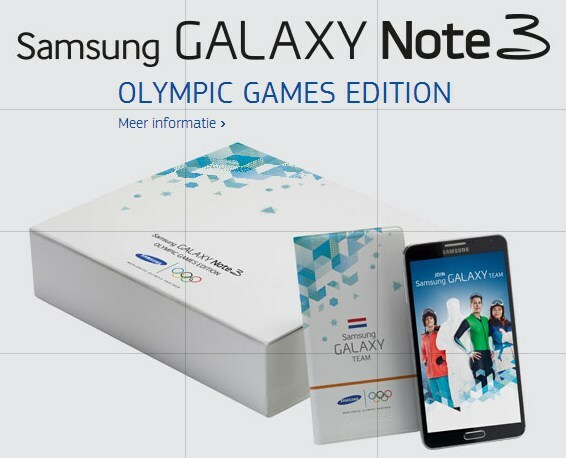 The Olympic Games Edition Note 3 has identical specs to the Note 3 we know and which we reviewed and loved but it comes in a new attractive packaging which reportedly includes tickets to the skating sessions in the Amsterdam Olympic Stadium and a special flip-cover with the Olympic theme. People who buy the new Olympic Games Edition Note 3 will also get a chance to win tickets to the Sochi Olympic Games. This move by Samsung is pretty obvious considering Samsung Galaxy Note 3 is the official phone of the Sochi 2014 Winter Olympic Games. Right now this Note 3 is only available in Netherlands and its is offered by the carrier KPN for free but there’s no word when (and if) Samsung plans to spread the availability.